Johnny Cash once famously sang that he’d “been everywhere, man” – from Chicago to Reno, from Tulsa to Crater Lake. And if you’re one of the millions of adults attempting to care for an aging loved one from a distance, you might just feel like you’ve been everywhere, too. As a long distance caregiver, it’s easy to feel pulled in many directions at once, as you try to provide as much support as possible to your aging loved ones, while also balancing having a family and a career of your own. From time spent coordinating with your family members, to hours spent behind the wheel commuting from place to place, it’s easy to feel like you’re always on the go, with no time to stop, rest, or recharge. A 2004 study from the National Alliance for Caregiving found that, on average, long-distance caregivers lived 450 miles away from their loved one – that’s 7.23 hours of travel time, one-way. Despite this, more than half of long-distance caregivers reported that they made substantial regular in-person visits, at least a few times per month. In fact, a stunning 23% reported that they were the “only” or “primary” caregiver for their loved one – despite living so far away. Nearly 75% of respondents said that they assisted their loved one with “instrumental activities,” such as “transportation, shopping, managing finances, or cooking,” for as much as 22 hours a month. That’s substantial, especially when you have other responsibilities to attend to at the same time. According to the National Alliance poll, nearly 80% of caregivers worked full- or part-time, and roughly 40% said that their caregiving duties had impacted their work schedules. And what’s more, it costs a lot to always be on the go. People who lived more than three hours away from the person they were helping reported spending nearly twice as much per month on expenses, compared to those who lived one to three hours away. It’s easy to feel overwhelmed when you serve as a family caregiver, and these feelings are often only compounded when you have to live far away from the people you’re responsible for helping. There are certainly challenges that are unique to long distance caregivers. It can be stressful to consistently be on the go from place to place, and it’s easy to feel cut off or helpless, being so far away from someone you love and want to care for. Fortunately, it is still very possible to still be an active and supportive caregiver, even if you live far from your elderly loved ones. But it’s important to take stock of your situation, be realistic about what you can and cannot do on your own, and be ready to seek out help when you need it. It’s hard to overstate how important it often is to get help for your aging loved one – and for yourself. If you live far away from your elderly loved one, it’s going to be harder, if not impossible, to provide the support they need, day after day. This could include driving and transportation services, assisting with activities of daily living (ADLs), providing housekeeping and meal prep, and keeping an eye on your loved one’s health and safety. For older adults, little changes in behavior or appearance could be a sign of a big shift, and it’s hard to track these things from miles and miles away. For these reasons and more, it may be important to hire a professional caregiver for your aging loved one. Even if you have a sibling or another family member nearby to serve as a primary caregiver, bringing on professional help, perhaps for as little as a few hours a week, can help your aging loved one get the support, attention, and personalized care they need – while also giving you and any other family caregivers an opportunity for some much-needed respite. There are many local and community resources available to help you find caregiving and companion services in your area. In some cases, you may also wish to look into alternatives, such as in-home medical care or assisted living (if your loved one has significant health needs that may require more hands-on attention). For more on some of the advantages of non-medical home care for families, read on here. Curious about what questions to ask, or how to get started finding a new companion? We have some helpful guides available here. Today, there are many technological advances that you can use to coordinate between family members, keep an eye on your aging loved one, and even make important care decisions – all from a distance. Automate what you can for your aging loved one, including bill payments, newspaper subscriptions, food delivery orders, and so on. Take advantage of collaborative technology. It’s easier than ever for everyone involved in caregiving to coordinate schedules and keep in touch online, thanks to shared calendars, spreadsheets, and other accessible online tools. Help out your loved one. 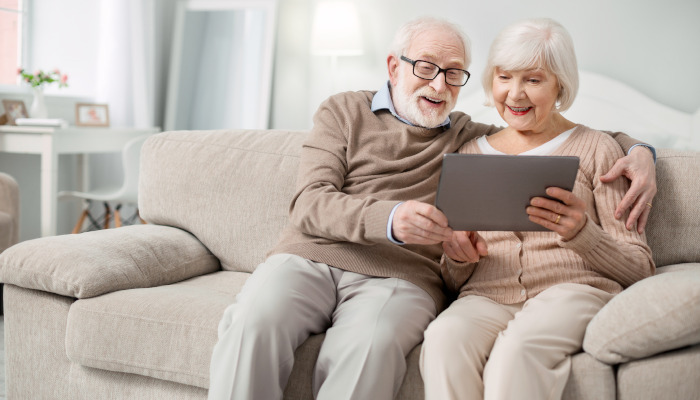 There are many ways that you can use technology to help out your aging loved one, from equipping them with automated medicine reminders, to setting up sensors or medical alert tools to help them immediately get in touch with first responders in case of an emergency. Collect important documents for your loved one, and have digital copies available, so that they can be stored and accessed from anywhere. When you live a distance away from your aging loved one, it’s important to take stock of what type of support you can realistically provide, and what you may need to leave to another family member, a family friend, or a professional caregiver. In any case, there are important scheduling and coordination tasks you can take on from afar, including designating a primary caregiver, scheduling family phone calls and meetings, and so on. Above all, remember that, in many cases, it’s going to “take a village,” as the old saying goes. There are going to be many different people involved in caring for your aging loved one at different points, including yourself, other local or long distance family and friends, professional caregivers, medical professionals, and more. It’s going to be important to make sure that everyone is able to keep in touch easily, and that everyone is clear on care plans, schedules, and all of the other little details that will come up. This can be done by setting up a regular meeting time or conference call for family caregivers. You may also want to set up a phone tree, or an online caregiving portal, where people can keep in touch, coordinate schedules, and access important personal and medical information for your loved one. When caring for an aging loved one, it’s easy to spend so much of your time and attention on others that you lose sight of taking care of yourself. As a result, burnout and stress are some of the biggest challenges facing family caregivers, whether you live next door or two states away. Don’t forget about your own health and wellbeing. Take time for hobbies, family time, travel, or work – basically, activities that have nothing to do with caregiving. Monitor your own health, and make sure that you’re eating right, sleeping enough, and staying hydrated. And, finally, remember that there are respite care services out there, able to help care for your aging loved one at times when you need time to rest, relax, recharge, or refocus on other things. For more on the strategies and uses of respite care, read on here. Finally, as a long distance caregiver, think about the visits you will get to have with your aging loved ones – and how you can best take advantage of however much time you get to spend together. If you have any questions about providing the best possible care for your aging loved one, don’t hesitate to get in touch with Companions for Seniors. At Companions for Seniors, empowering elders and their caregivers is our passion, and we’re happy to talk over any thoughts or questions you might have. We’re always here to bounce ideas off of, and help you find the best course of action for yourself and your senior loved one. Wondering if your older loved one would benefit from in-home care? Don’t hesitate to drop us a line to discuss creating a personalized care plan for your senior. At Companions for Seniors, our mission is to help seniors live independently and with dignity in the comfort of their own home by empowering them to lead an active and enriched lifestyle, connecting them with their community, and nurturing meaningful relationships. Our companions are trained, bonded, and insured, and can help provide a variety of services designed to help your loved one remain in the comfort and security of their own home. We’re locally owned in the Chicago area, with clients in the city and suburbs. Don’t hesitate to contact us today to get the conversation started. Are Mood Swings in the Elderly a Sign of Something More? Is Your Senior Family Member Coping With Chronic Pain?